When Should You Go On Your Honeymoon? 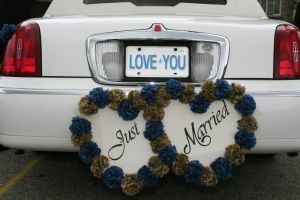 You know in the movies when a bride and groom leave their wedding in a decorated car that says “Just Married” and then they drive off to the airport? If your wedding is in July and you’ve always dreamed of a honeymoon in Australia, you probably shouldn’t leave on your honeymoon right away. Since the seasons are opposite in the southern hemisphere, July is the dead of winter in Australia. Other similar examples include going Italy in August (all of the locals go on holiday then, so you’ll be stuck with tourists only), the Caribbean in September (hurricane season), and anywhere September – November (Michigan football season… just kidding… but not really). 2. What’s your job situation like? It’s important to consider whether you and your fiancé will be able to take off as much time from work as you’d like. Okay, maybe you’d like to take off several months, but let’s try to be realistic here. I’m just saying that if you just started a new job and only feel comfortable taking off one week now, but you’ll be more comfortable asking for two weeks off in six months, maybe you should wait.